Triple Scale Hydrometer - Texas Brewing Inc. 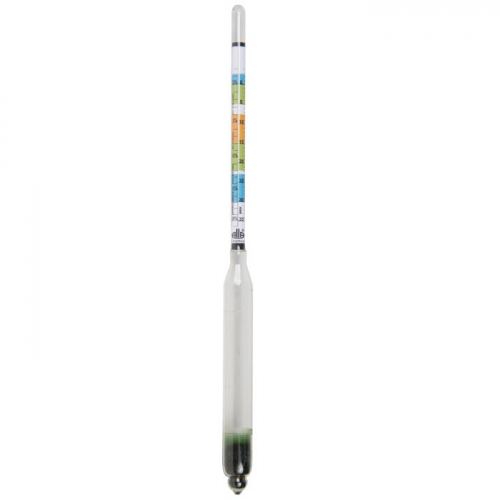 This triple scale hydrometer measures specific gravity, alcohol by volume, and sugar per litre. Triple Scale Hydrometer (10.5 inch) with SG scale of .0982 - 1.160, potential alcohol scale of 0 - 20 and brix scale of 0 - 35. Larger text for easier reading then most hydrometers. Recently bought this to replace the one I accidentally broke. This new one is easier to read and easy to use. Next time going to eventually buy another to have as a backup.